We now know that Nintendo's next-generation game console will be the Switch, a hybrid device offering portable and home gaming in one. But there's a lot we don't know. What games will it launch with? How much it will cost? What's that screen like? Will it play games on a TV at 1080p? How long will the battery last? We'll find out more about the Switch before its March 2017 release, and the answers to those questions, and more, will likely dictate our overall judgement. Nonetheless, we're nothing if not opinionated, and seeing Nintendo launch a new console has got us talking. So without further ado, here are eight Engadget editors with their first take* on the Switch. *Other opinions are also valid. 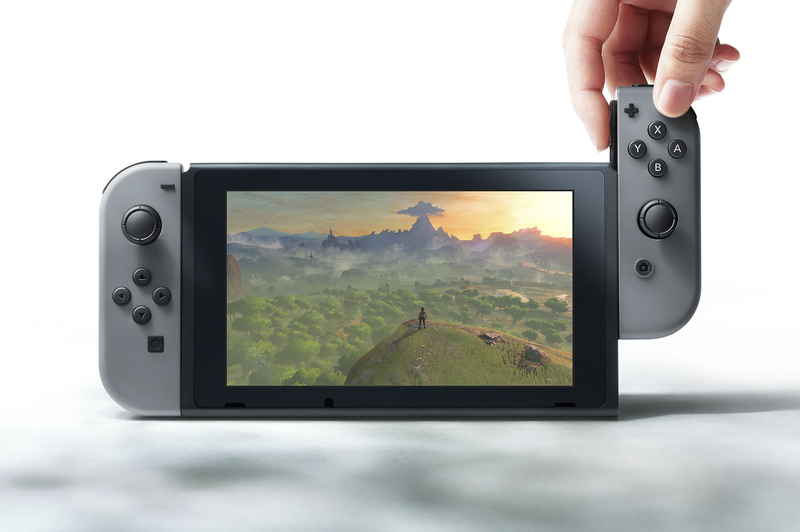 The Nintendo Switch is both a portable and home console, and that's brilliant news. In a year or two -- once the Wii U and 3DS are inevitably retired -- that means every Nintendo studio will be making games for the same system. Brilliant. If you're a Switch owner, you should (emphasis on "should") get a steady stream of titles every year, regardless of the support from third parties. Pikmin, Metroid, Fire Emblem. All of these franchises will soon be focused on the same console and player base, building out a library that's attractive to more and more people. The 3DS has a wonderful back catalog: I want that quality and diversity replicated on a big-screen TV. If Nintendo can deliver on that, I'll be in, regardless of whether it has Mass Effect: Andromeda or not. As for the hardware itself? It looks a little finicky to me, with lots of intricate parts for children to break or lose. I'm worried about the ergonomics too -- some of the different controller modes look a tad cumbersome. Sure, there's an (optional) stand-alone controller, but that should be for home use only. When I'm out and about, I'll be using the Joy-Con attachments -- I just hope they're comfortable over extended play sessions. Even though we've been hearing rumors of a hybrid console from Nintendo for a while, the Switch's debut still floored me. Once again, Nintendo is going in a completely different direction than Microsoft and Sony. Based on the little we've seen of the Switch so far, it seems like a far more intriguing attempt than the Wii U. In many ways it reminds me of the original Wii; it introduces entirely new ways of playing games -- local multiplayer anywhere FTW! -- though it might seem like a gimmick to some. If anything, the Switch shows how far we've come in mobile hardware. NVIDIA claims it's powered by a custom Tegra processor that has the same technology as its current desktop GPUs (we're still waiting for more specifics). The demo video shows off complex titles like Skyrim and The Legend of Zelda: Breath of the Wild. At the least, the Switch seems more powerful than the Wii U, which was Nintendo's first foray into HD gaming. Instead of pursuing 4K like everyone else, it looks like Nintendo is trying to redefine what's possible on mobile. In the end, Nintendo is going after the gamers who will prioritize the flexibility of gaming anywhere over bringing the most pixels possible into their living room. After seeing both Sony and Microsoft work themselves into a tizzy to support 4K, and in the process confusing the heck out of consumers, I can't blame Nintendo for trying something different once again. I'm a sassy young woman living in the big city and working hard for my money. I got no time for games. Well, not like I used to, anyway. I love the console experience for how big and immersive it can be. However, as I've gotten older it's been increasingly hard to find the time and energy to sit down and focus on an expansive world that requires dozens of hours to explore. I've gravitated more toward my Nintendo 3DS, but it's not on the same grand scale, by design. Thus it's no coincidence that the Switch reveal video was very much a lifestyle showcase, featuring people in my general "young adult" age group and how they would use the Switch. No more scheduling time every night for Zelda, no more declarations to "treat yo self" by playing Mario for a few hours. The Switch is a home console that works around your schedule. I might actually be able to get back into JRPGs. Though I probably wouldn't bring it to fancy balcony parties. There's going to be lots of talk today about what the Switch means for Nintendo, what it means for consoles and what it means for the future of gaming. Or something. All I know is what it means for me: It'll be the first home console I'll buy in nearly 20 years. I mean it: I've not had a gaming console under my TV since the Super Nintendo. OK, I briefly owned a Wii (for a review) and lived in shared houses with Xbox/PlayStations, but nothing's convinced me to part with my cash for a long while. Switch, on the other hand, pushes all of my buttons -- in a good way. I've not been abstaining from games since the SNES, obviously. I mostly play retro or handheld consoles (and retro handhelds, especially). So the idea that I could return to modern home gaming and get a new handheld makes Switch a no-brainer for me. The fact that it's Nintendo just sweetens the deal. There's something else I like about Switch too. The Wii and Wii U weren't ... terrible, but the smurfy design and the cutesy Mii characters, etc. didn't resonate with me. Switch seems to shed some of that overt softness for a slightly more grown-up feel while still looking, somehow, "Nintendo." Last year I predicted that Nintendo's next console wouldn't just be a Mario-powered Xbox: Launching a standard-issue game console would have stripped the company of everything that makes it fun, unique and worthwhile. I'm so glad I was right: The Switch is exactly what Nintendo needs to compete with Microsoft and Sony. The Nintendo Switch has the potential to become the console Nintendo's been trying to build for generations -- the console gamer's essential second device. Think about it: Nintendo hasn't attempted to compete on raw power in over a decade, instead trying to woo gamers with some sort of hook that sets its hardware apart from Sony and Microsoft. It hasn't always worked (sorry, Wii U) but this time, it just might. The Switch isn't the console with the goofy motion controllers. It's not the underpowered machine with the weird tablet, either. It's the modular home game console you can take with you and play on an airplane. It's not trying to replace the Xbox One or PlayStation 4 in your entertainment center, and it can live alongside it. And when you have to leave the house and can't take those high-powered boxes with you? Well, you'll have the Nintendo Switch. This bridges a gap Nintendo's been trying to close for awhile. Remember when the company launched Smash Bros. on both the 3DS and the Wii U? When it brought Hyrule Warriors to its portable device? How it recently announced that Super Mario Maker would be shrunk down to fit on its stereoscopic foldable? That's what the Nintendo Switch is. It's the company giving its portable gamers what they really want: home console games. Better still, it doesn't split its own market: Microsoft and Sony diehards who only buy Nintendo consoles for exclusives no longer need to buy two devices to play all of their favorite franchises. Just one. And they can take it to the airport, on the bus, to a friend's house, or they can simply play it in bed. That's a much better pitch for being the console gamer's essential second device than the Wii U or 3DS ever had. And that's exactly what the Switch needs to be. I have a fairly large, open-plan living area. If I take my Wii U GamePad to the kitchen, about 15 feet from my TV, it loses signal. As a huge Nintendo fan, all I really needed was a better Wii U. That means more portability, a better screen, and better battery life. The Switch is definitely more portable -- I could take it to someone else's kitchen. Given the lack of a stylus, it's almost certainly going to have a nicer screen, without the horrible resistive touchscreen overlay. The one thing I don't know about is endurance, but I'm pretty sure it'll last the time it takes me to cook a meal. I might sound unenthused about the Switch, but I'm really not. It's just that I was absolutely going to buy one anyway. I'm happy for Nintendo that (for now at least) third parties are on board, but in reality I'm likely to be playing those cross-platform games on my existing systems. I buy Nintendo consoles for Nintendo games, and this will definitely have lots of those. It looks like Nintendo has finally started paying attention to the competition, but not in the way I expected. Rather than aping Microsoft's and Sony's designs of oblong boxes (or sandwiches like the PlayStation 4 Pro) the console looks like a piece of lifestyle gadgetry that'd unobtrusively hang out on an end table or bookshelf -- not dominate a chunk of your A/V rack. And it maintains the "friendly" look Nintendo has been hawking for decades. I'm a fan. For me, "portable gaming" means a console I can easily carry in my messenger bag or backpack and hook up at a friend's house. And for that, the Switch looks perfect.